The Ohio State University College of Nursing is proactively committed to enhancing diversity in nursing education and the nursing workforce to achieve academic excellence and health equity. We are among the best nursing schools in the nation. Your exceptional education here at Ohio State means that you'll have the opportunity to engage with concepts of diversity both inside and outside of the classroom. The United States Census predicts by 2043 that racial, ethnic and cultural minority populations will make up the majority of the United States population. Below, you can see a comparison of our population in 2012 vs. the predicted population in 2060. We know that culturally competent healthcare providers respond more appropriately to patient concerns, communicate more effectively and, ultimately, create better patient outcomes. Therefore, only through the development of cultural competence can we reduce health disparities and move toward health equity. In 2004, the Sullivan Commission published a report titled 'Missing Persons: Minorities in the Health Professions'. The report detailed how a lack of racial, ethnic, cultural and gender diversity in the nursing profession negatively impacts our ability to meet the needs of our rapidly changing population. In fact, the current demographics of the nursing workforce are not representative of our patient populations. 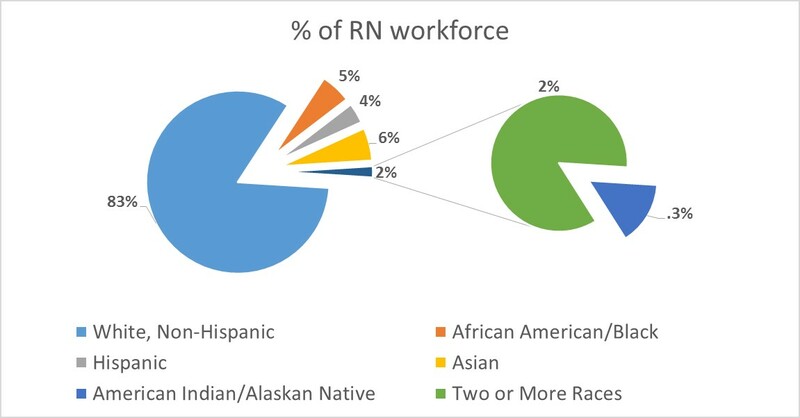 Below, you can see the current makeup of the registered nurse workforce (data from '08). This obvious disparity will only grow as our population continues to diversify. When we compare the demographics of the nursing workforce in 2008 with the current population (2012) and with the projected population (2060), this difference becomes even more startling. In order to meet the nation's health needs, we must increase the number of students from historically underrepresented populations in nursing! Nursing professional organizations throughout the country agree. A few of these organizations include: The Robert Wood Johnson Foundation, The National League for Nursing, The American Association of Colleges of Nursing, The National Student Nurses' Association and the U.S. Department of Health and Human Services. These groups of nursing leaders recognize the importance of having a nursing workforce which mirrors our patient populations. Furthermore, these organizations call for action across the nation, at all levels, in both schools and the workplace. To meet this call, each of us, no matter our personal identities or backgrounds, have a place in enhancing diversity in nursing and ensuring exceptional patient care for all the worlds' citizens.